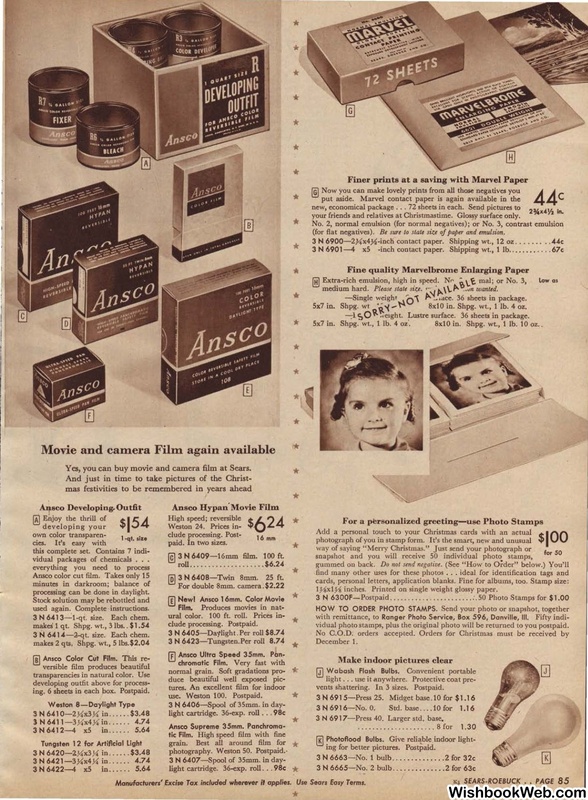 Yes, you can buy movie and camera film at Sears. vidual packages of chemicals . . .
processing can be done in daylight. ing. 6 sheets in each ):>ox. Postpaid. 12-4 x5 in.. . . . .
3 N 640B-Twin 8=. 25 ft.
Be sure to state si:te of paper and emulsion. .ace. 36 sheets in package. 8x10 in. Shpg. wt., 1 lb. 4 oz. !-ustre surface. 36 sheets in package. 5x7 in. Shpg. wt., 1 lb. 4 oz. 8x10 in. Shpg. wt., 1 lb. 10 oz..
1}1!xl }1! inches. Printed on single weight glossy paper. vidual photo stamps, plus the original photo will be returned to you postpaid. vents shattering. In 3 sizes. Postpaid. 3 N 6917-Press 40. Larger std. base. ing for better pictures. Postpaid. 3 N 6422-4 x5 in.... . .